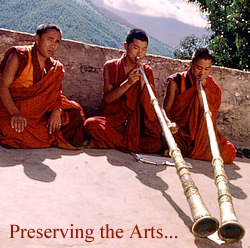 Performing Arts Center of Bhutan in Thimpu: Protecting Bhutan’s culture. Try to imagine a culture without music, dance, or literature. You can’t. The arts are both substance and spice, the “soil” that keeps a culture together and brings it to life. The “Performing Arts Center of Bhutan” to be built in Thimpu, Bhutan's capital, will be a living institution, playing a key role in preserving Bhutan’s culture by offering a contemporary outlet for performances of traditional music, dance, theater, film, educational programs, and other special events. Just as the vanishing Hawaiian culture successfully created the Polynesian Cultural Center, a performing arts center in Thimpu Bhutan will unquestionablyprovide an inspirational force. This center will help to preserve the precious identity of Bhutan before it is lost to the world forever.